“Look! Up there!”, the woman gasped. “It’s a bird!”, her husband guessed. “It’s a bird!”, the husband guessed again. “No! It’s Man Made Of Steel!”, said an older lady who had joined them on the scene. Indeed, Man Made Of Steel had just flown across the sky after, quite probably, having saved yet another life. It had been a month since the first sighting of the fearless hero and crime in the vibrant city of Bigtown had reached its lowest point. The metallic wonder had been a blessing. But who was this phenomenon? That’s what ace reporter Sally Sullivan, of the Bigtown Daily, was trying desperately to find out. As yet, she had only been able to catch a glimpse of the mysterious helper, not enough to paint a full picture. Somehow, she knew she would need to get closer to him, be the first reporter in town to get an interview. The Olsen twins had been no help at all. The Daily’s go-to photographers, Jack and Jack, had been joined at the elbow since birth, which made their career twice as hard but, despite the occasional crooked shot, they often surprised their colleagues with impressive results. “Anything on that Man Made Of Steel, fellas?”, Sally asked the twins. “Not yet.”, they replied in unison. “Will you go out with me?”, the twins asked, again, in unison. But Sally had already walked away without hearing their question. She was deep in thought. 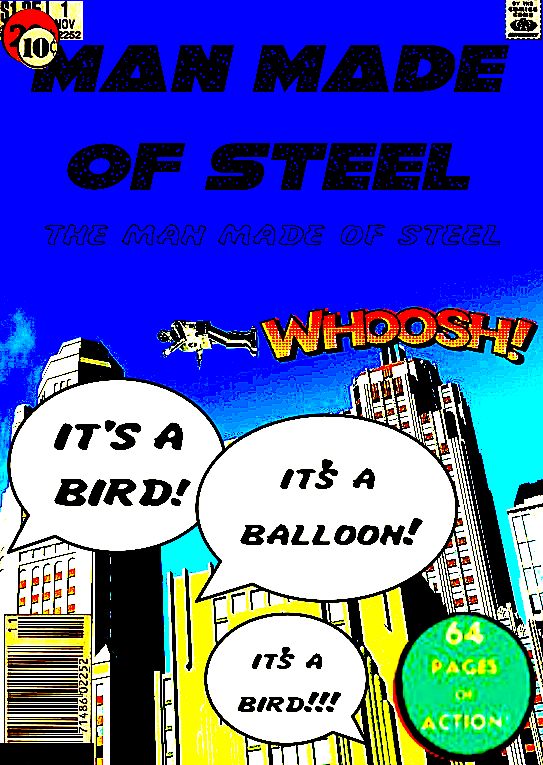 Where would a Man Made Of Steel go? Meanwhile, on the other side of town, a child was crying. With a “whoosh” and a “thump”, Man Made Of Steel appears and lands next to the child. Upon seeing him, the boy’s eyes widen in wonder. “What appears to be the problem, young citizen?”, the hero asked somewhat robotically. On that note, Man Made Of Steel deploys a cannon from inside his back and points it at the tree in question. Without warning, a thick, blood-red laser beam booms out of the cannon rendering the entire tree to ashes. “But…”, the child is too stunned to finish his thought. Man Made Of Steel goes to ruffle the boy’s hair playfully but, his strength much too great, he instead proceeds to mistakenly crush the child’s head like an egg. Not noticing anything wrong, Man Made Of Steel’s laser cannon folds back into him and he is soon off, up and way, flying to further adventures. Sally turns her radio off promptly. Man Made Of Steel couldn’t possibly pass up a heroic act like extinguishing a fire like that. I only hope I get there in time! Running out of her office, Sally calls out to the Olsen twins. She sees one of her colleagues, the rather sheepish, forgettable Cal Karlson, exit the elevator and yells at him from across the room while running towards him. Cal goes to answer but Sally interrupts him. Cal goes to ask a question but she interrupts him again. They both get in the elevator and the doors close. By the time Sally and Cal finally arrived at the scene, the fire had already engulfed six blocks. Dark smoke filled the sky, fire engines everywhere, chaos. “My god…”, Sally said to herself out loud. “I know. Horrible, isn’t it?”, Cal confirmed naively. “Tragic.”, Cal said in complete agreement. Sally turns to look at Cal but he is inexplicably nowhere to be seen. The fire marshal suddenly spots something above, in the sky. Everyone promptly drops whatever they were doing to look at the hero who has, indeed, appeared up in the sky, above the inferno he himself created. Swooping down through the fire like a phoenix, the metallic justice man starts blowing the fire away with a giant fan he had deployed on his chest seconds prior. The fire doesn’t so much disappear as it does spread to previously unaffected blocks. Man Made Of Steel proceeds to move the fire all the way across town to the neighboring metropolis: Gothtown City. Sally, unaware of the colossal damage caused by the hero over the rest of the entire town, looks at the wreckage left by the fire and starts feeling both moved, especially when she spots the bones of a dead child on the ground next to her (his head barely looking like a head anymore), but also a peculiar sense of pride. Man Made Of Steel had proven himself a true patriot, he had come back for us. “What’s all this, Sally?”, a voice called to her nearby. It was Cal, still wearing his good-old prescription glasses and looking completely unfazed by the events. “I was buying a hot dog.”, he replied candidly, not holding a hot dog. Sally could not put her finger on it. There was something about Cal’s red eyes, his straight posture, his hard, blockish shoulders and his monotone way of talking that somehow felt uncanny. Which was bizarre. After all, Cal was just your normal, paper-pushing, eight-foot tall reporter. More of Jerry Jones’ unique comic-books coming up soon.